In Atmospheric Circulation – Part One we saw how the higher temperatures in the tropics vs the poles (due to higher solar insolation in the tropics) led to a greater “geopotential height”. This means simply that the height of a given atmospheric pressure (e.g. 500mbar) is greater in the tropics, and so the geopotential surfaces slope down from the tropics to the poles. 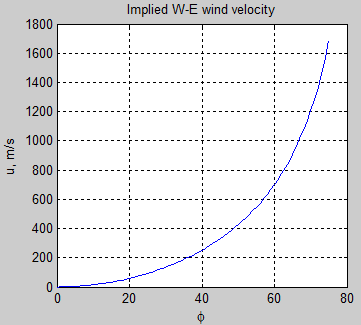 And in Atmospheric Circulation – Part Two – Thermal Wind we saw how that effect, due to the Coriolis force, causes a W-E wind (“zonal wind”) that increases with height. This culminates in the sub-tropical jets (see figure 5) that are a maximum around 30°. The question arise – why don’t the zonal winds just keep increasing in the poleward direction? Why the peak value at the sub-tropics? The angular momentum of a parcel of air is conserved if there is no net torque acting on that parcel. So let’s consider a parcel of air at the equator at rest with respect to the surface of the earth. Now let’s push that parcel of air out towards the north pole and let’s calculate the resulting net W-E velocity of that parcel. 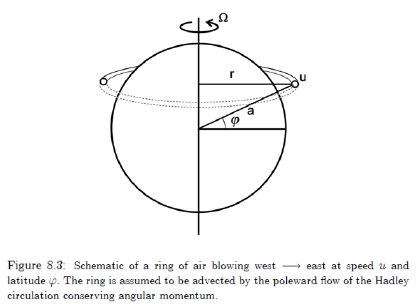 – and so for conservation of angular momentum the W-E velocity of the air with respect to the ground must increase. If we refer back to figure 5 in Part Two we see that the annual average maximum of the zonal winds is around 30 m/s. The rotational speed of the earth is a critical factor. We see that the effect of increasing rotation is to create more and more “cells” – like the Hadley cell, the tropical to sub-tropical cell, which was shown in figure 4 of Part One – and to create a stronger differential temperature from equator to pole. The faster the earth rotates the “harder” it is for warmer air to move poleward and so the differential solar heating does not get “smeared out” poleward. This paper by Williams is quite fascinating. It has a number of simplifications like no variation in longitudinal effects, a “swamp” ocean and some factors that are fixed at the current earth’s rotation value (note 1). Isaac Held recently wrote a post, The “Fruit Fly” of Climate Models which highlights many issues around simplifying climate models to illustrate the important principles underlying climate dynamics. This post is well worth reading as well as exploring the referenced papers. Prof. Isaac Held is one of the gurus of climate dynamics and has been writing influential papers on this (and other) topics since the mid 1970s. For example, Nonlinear axially symmetric circulations in a nearly inviscid atmosphere, Held & Hou, Journal of the Atmospheric Sciences (1980). Many scientists have contributes to this topic, including the well-known Prof. Richard. S. Lindzen with Axially symmetric steady-state models of the basic state for instability and climate studies. 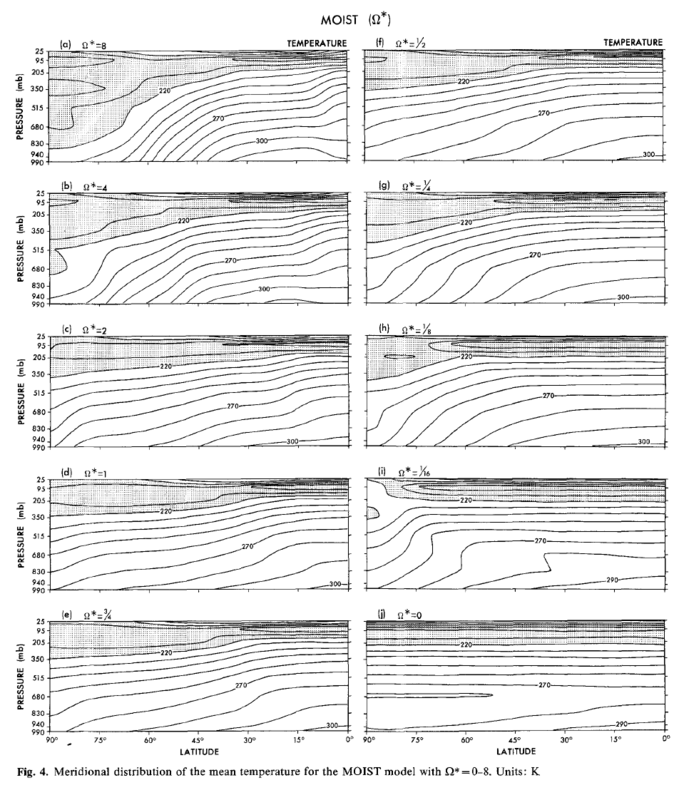 Part I. Linearized calculations, EK Schneider & RS Lindzen, Journal of the Atmospheric Sciences (1977). In the next article we will look at how eddy motions transport heat to the poles outside of the Hadley cell. In this paper (to be published in two parts), we generate a comprehensive set of circulations by varying some of the fundamental external parameters and primary internal factors that control the dynamics of a terrestrial global circulation model (GCM). The solutions are developed for two purposes: (1) to study basic circulation dynamics; and (2), to define the parametric variability of circulations. 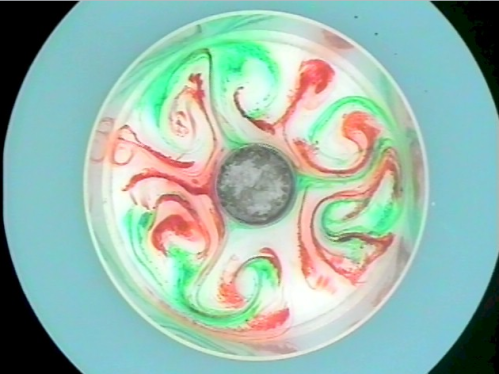 By altering the size, strength, and mix of the eddies, jets, and cells in a variety of flow forms, we hope to develop further insight into how they arise and interact. By developing a wide range of circulations, we hope to gain perspective on the parametric circumstance of Earth’s climate and to broaden the data base from which we extrapolate in theorizing about other planets and other climates (Hunt 1979a, b, 1982). 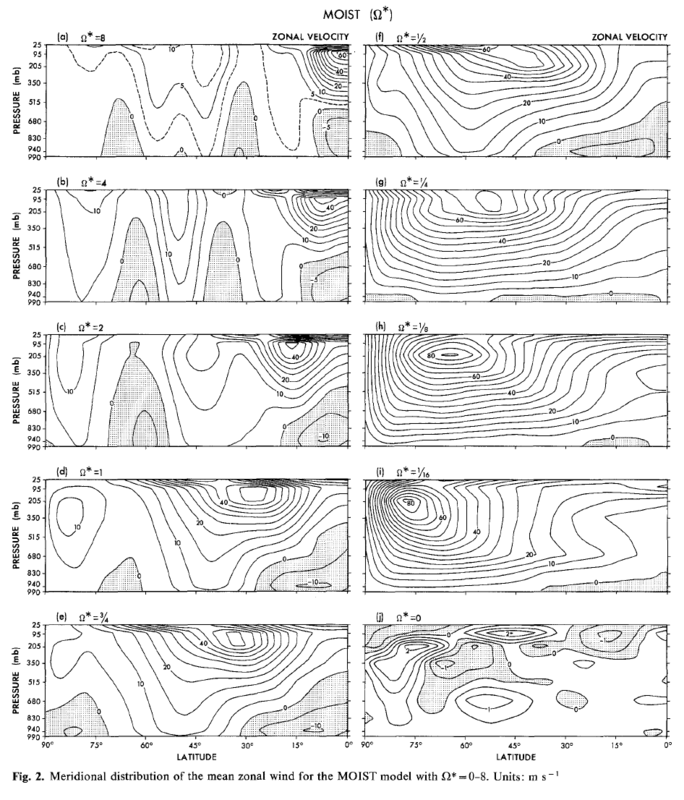 To generate as complete a circulation set as possible, we evaluate moist, dry, axisymmetric, oblique, and diurnal model atmospheres over a wide range of rotation rates: Ω* = 0-8, where Ω*= Ω/ΩE is normalized by the terrestrial value. For the set to be meaningful, the GCM must be valid at all parameter values. We believe this to be so, although we cannot prove it. The GCM has some known limitations, such as the non-universal boundary-layer and radiation formulations, but these do not affect the fundamental structure of the flows. We also assume, in presenting the solutions, the hypothesis that circulation variability is limited to the mix of a few elementary components that can be understood in terms of regular quasi-geostrophic (QG) and Hadley theories. The interpretation of the solutions in terms of these theories is essentially qualitative — just as it is for the terrestrial (Ω* = 1) case (Held and Hoskins 1985). 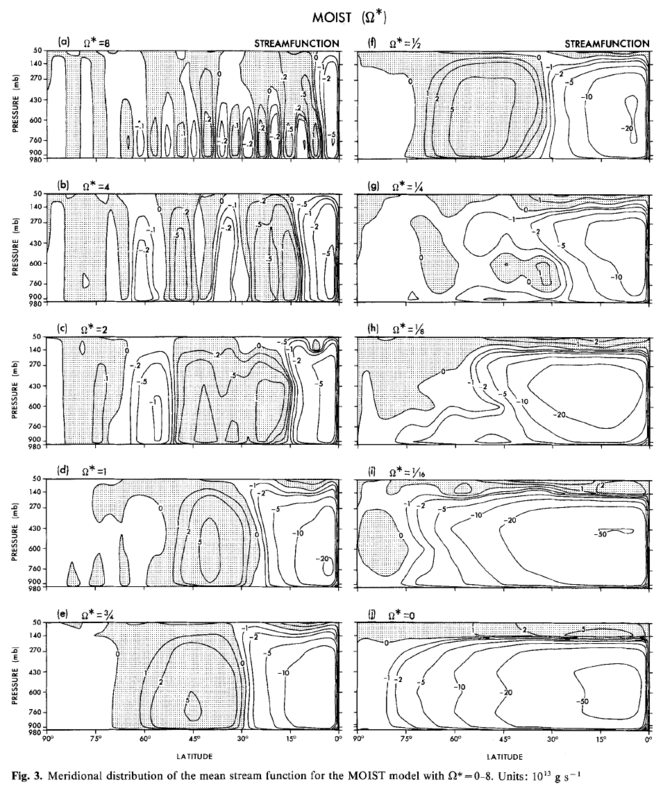 The modern view of the terrestrial circulation is still based on the explanation summarized by Lorenz (1967, 1969): that in low latitudes, the time-averaged flow is mainly the product of thermal forcing (as suggested by Palm6n) and described by quasi-Hadley (QH) theories; that in mid-latitudes, the time- and zonal-averaged flow is essentially the product of forcing by the large-scale eddies (as suggested by Eady, Rossby and Starr) and described by QG theories; and that the two flows and regions interact extensively. In the Northern Hemisphere, strong orographically driven standing waves complicate this view (Wallace and Lau 1985), but we ignore surface inhomogeneities in this paper. The outstanding circulation issue posed by Lorenz in 1969 concerned the role of the eddies in forming and maintaining the angular-momentum characteristics: why is the eddy-momentum transport mainly poleward; what is the basic state with which the eddies interact; what form does the idealized symmetric-Hadley (SH) state take and how does it relate to the natural state? Some of these questions have been resolved and new ones have emerged..
As a representation of Earth’s atmosphere, the GCM has significant deficiencies. For example, it omits land surfaces and ocean transports, it does not forecast the cloud, carbon dioxide and ozone distributions, and it has no snowcover or ice-albedo feedbacks. The imposed distributions of the minor gases, clouds, and albedo in the radiation calculation relate only to the Ω*= 1 state and at other Ω* produce only a relative forcing and circulation. But for our purposes any reasonable thermodynamical forcing suffices and the strong tuning of the radiative heating to conditions at Ω*=1 at least provides a realistic reference state. A more troublesome non-universality having a more direct dynamical impact lies in the PBL formulation. In the GCM, the PBL is assumed to be neutrally stable so that only mechanical mixing occurs and the associated Prandtl- and Ekman layer depths are fixed at empirical values. This prescription provides a reasonable first approximation for Ω*= 1 studies. Although a formulation with ze ~ Ω-1 would be more appropriate for an Ω*-varying GCM, even it fails at low Ω*. Given such limitations, we decided not to make the PBL formulation a function of Ω*. Thus the PBL parameters, like the radiation ones, are fixed at their Ω*= 1 values. This is not a satisfying compromise to make but it does eliminate the great inconvenience of having to make the vertical grid spacing a function of Ω*. We believe that these PBL limitations mainly affect the surface winds and do not significantly influence circulation structure.